Ballintoy is situated about 6 miles west of Ballycastle. The present harbour was built in the eighteenth century by a trickster to facilitate the shipping of coal to Ireland. During the late nineteenth century the harbour was extensively used for the shipping of sett stones - a small rail track once existed for moving the piles of sett stones and limestone to the quayside. At Brockie Quarry near Larry Bane over one hundred men were employed chipping and shaping sett stones that went to pave the streets of cities such as Dublin, Cork, Wexford, Limerick and Glasgow. The well built lime kiln stands as a testament to the harbour's industrial past - burnt lime would have been drawn away by horse and cart to help build the numerous stone cottage and rural halls in the district. 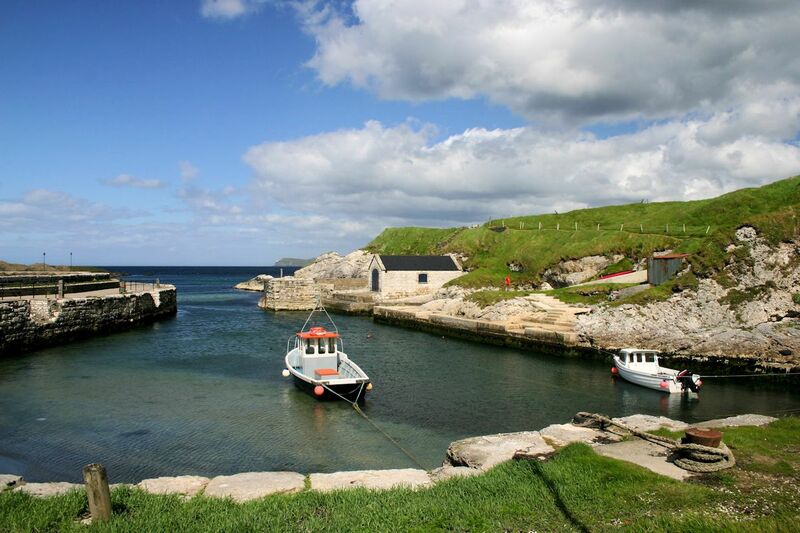 Ballintoy is still a working harbour for local fishermen. In recent years the harbour has been upgraded and is still a working harbour for local fishermen dealing mainly with salmon and lobster fishing. It is also used as a base by deep sea divers. A number of pleasure craft use the harbour. It is sheltered from prevailing winds by scores of basalt islands. The harbour mouth looks towards Sheep Island and Rathlin (see last image under 'More photos').